Driving while intoxicated is a serious charge in all states – and New York is no exception. Even a first offense could cost you $1,000 in fines, a six-month license suspension and up to one year in jail, according to USAttorneys.com. If you are facing DWI charges, it is critical that you take steps to protect your interests. Even if you failed the breathalyzer, there may be a defense that applies to your case. One of your first calls should be to a DWI attorney. 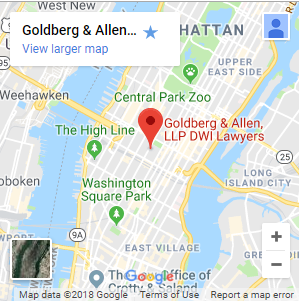 A New York City DWI lawyer from Goldberg & Allen, LLP can evaluate your arrest, gather evidence and structure and aggressive defense. Schedule a consultation today by calling 212-766-3366. Police do not have the authority to pull you over unless they have a reasonable suspicion that you have committed a crime or are in the process of committing a crime. If the officer did not have reasonable suspicion to make the stop, then any evidence he or she gathered during the stop is not admissible in court. An officer cannot arrest you without probable cause. If you were driving, the keys were in the ignition, and you displayed signs of intoxication or failed a breathalyzer, then the officer has probable cause to make the arrest. If the officer did not have probable cause, then the arrest was a violation of your rights. New York is an implied consent state, meaning that you automatically consent to a blood, breath or urine test as soon as you start the ignition. You can refuse to take the breathalyzer test, but this will result in a license suspension of one year for a first offense. Even if you fail the breathalyzer, your DWI lawyer may be able to challenge the results in court. Perhaps the officer administered the test incorrectly, or maybe the device was not calibrated properly. Sometimes these devices have defects that affect the results. If the results may have been inaccurate, then they are not admissible in court. Drivers can refuse to take field sobriety tests without immediate consequences, but if you fail one, the prosecuting authority can use that fact against you in court. However, your DWI attorney may challenge the results of your FSTs. Several factors can affect a suspect’s performance including back pain, a knee injury, age or obesity. If you have evidence to prove that you had no choice but to drive intoxicated, then the court may dismiss the charges. For example, if a child was injured and there was no sober driver available to transport him or her to the hospital, then the court may drop the charges. If you are facing DWI charges, contact Goldberg & Allen, LLP. A New York City DWI attorney can evaluate your arrest and construct a defense based on the unique facts of your case. Call 212-766-3366 today to schedule a consultation.